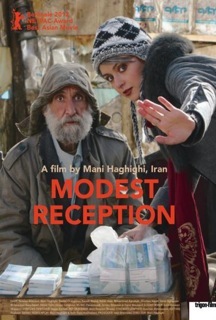 Review: “Modest Reception” has a turbulent starting. The frenetic jazz heard at the opening credits, soon gives place to an effusive scene involving a strange couple and a checkpoint soldier. This couple simply decided to make a trip to a mountain region and deliver bags full of money to random people. Without knowing their motives or intentions, we just follow the reactions to this unlikely offer. Some people are completely indifferent; others are greedy; some others act suspicious, having to be persuaded to accept the money. Although obscure, the story provokes us somehow. The couple’s behavior denotes some madness, since they seem to enjoy what they’re doing but at the same time can’t hide an enraged personality. Alternating among humor, seriousness and some humiliation, "Modest Reception" simply shows us how unpredictably people behave when confronted with money. A radical experience with an unclear conclusion.